A biologist studying patterns of sexual selection, Lucy Stone knows a lot about mating–particularly that in the animal kingdom, males will go to any length to attract females. Why, then, are their human counterparts so hopeless in courtship? This is the question that Lucy and her best friend, Martha McKenna, struggle to answer. Consider Adam, Lucy’s boyfriend of two years, who demonstrates on an ostensibly romantic camping trip that he can’t build a fire, split wood, or jump-start a car. Worse still, he’s scared to go into the woods after dark. Or take Jesse, Martha’s younger brother, an opera aficionado and neurotic extraordinaire who can’t summon the courage to make the first move on the woman he’s crazy about. And what about the extensive list of men with whom Martha has endured the torments of the first date. But then there’s Cooper Tuckington, Lucy’s best friend from college. Born and bred on his family’s West Virginia dairy farm, Cooper fits anyone’s description of a man’s man, and yet he is chivalrous and charming. During his annual visit to New York City, he rewires Lucy’s lamps, builds her shelves, and holds forth on subjects from great painters to the great outdoors, all the while pulling out chairs and opening doors for the ladies. Surely, think Martha and Lucy, the men in their lives would benefit from the tutelage of someone who knows how to treat a woman. Thus, Man Camp is born. With a little feminine persuasion, Lucy and Martha convince Adam, Jesse, and a handful of their other male acquaintances to visit Cooper’s farm, where they will learn everything a guy should know, from cars to carpentry to chivalry–and that’s just the C’s. But life on the farm isn’t exactly as it seems–and the boys soon prove themselves in ways the women would never have imagined. In the process, Lucy and Martha themselves learn a good bit about life and love. 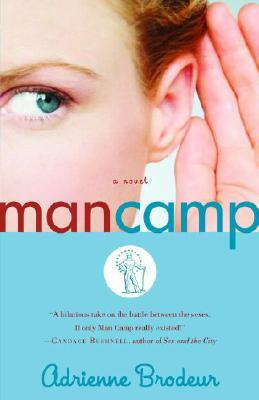 The perfect can’t-put-it-down novel for all of us who’ve needed to bring out the inner man in the men we love, Man Camp is a brilliant, witty, and insightful romp through the wilds of dating and mating. Adrienne Brodeur was the founding editor of Zoetrope: All-Story. She lives in New York City.